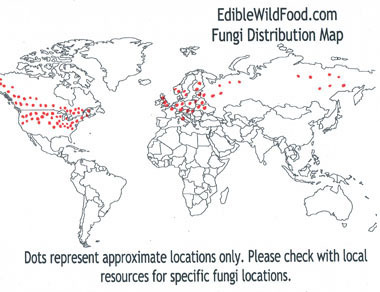 Overview: Fomitopsis betulina (previously Piptoporus betulinus) is commonly found in countries around the world that have birch forests. 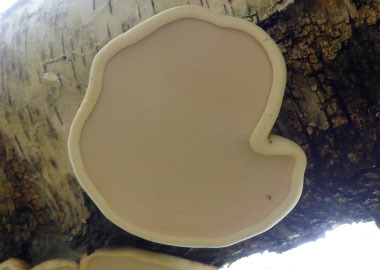 This edible and medicial polypore has been extensively studied and there is ample evidence supporting the antibacterial, anti-parasitic, antiviral, anti-inflammatory, anticancer, neuroprotective, and immunomodulating activities. Birch polpores are a common basidiomycota brown rot macrofungus that grows on decaying birch trees. 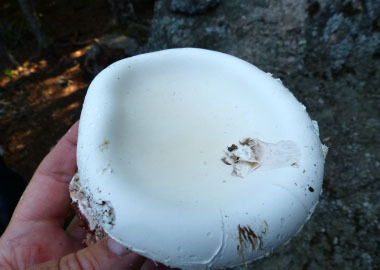 By the time the white fruiting body emerges, decay to the tree is extensive. In 1753 Carl Linnaeus first described this fungus and referred to it as Boletus suberosus, and later the French mycologist Jean Baptiste Francois (Pierre) Bulliard changed the specific epithet to betulinus - a reference to the birch trees (Betula spp.). 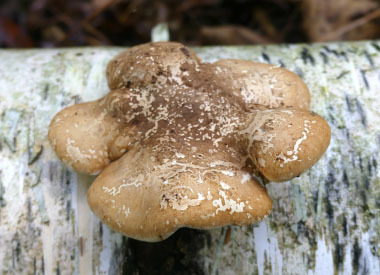 In 1821, Bulliard transferred this very common and widespread polypore to the genus Polyporus, where it remained for sixty years. 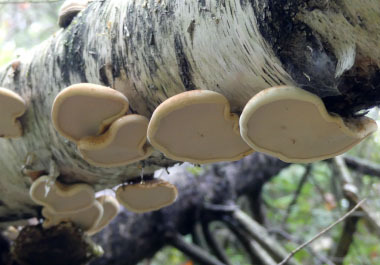 In 1881, Finnish mycologist Petter Adolf Karsten transferred the birch polypore to a new genus, Piptoporus, which he had created. 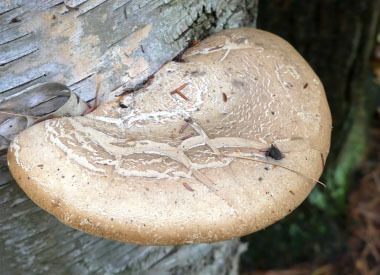 Distinguishing Features: Birch polypores have white-to-brownish fruiting bodies. They are annual, emerging from the bark of dead or dying birches in spring and summer. They deteriorate slowly and persist through the winter; although when they are brown or blackened they are no longer useful. Most fungal conks are woody and hard, but birch polypores have a soft, leathery feel and an inflated look. They are attached to the tree by short, fat stalks. The smooth upper surface folds over at the outside edges, leaving a rounded rim around the flattened lower surface. They start as a subglobose then forming a 'hoof' shape finally becoming an enlarged flat bracket. 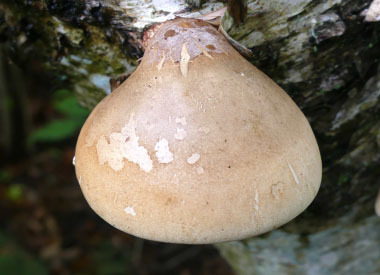 Height: On average these polypores reach 6cm (3”) high and 30cm (12”) wide. Habitat: Birch polpores are almost exclusively restricted to dead or dying birch trees. The brackets are annual but may persist through one winter. They can be found throughout northern Europe, Canada, Asia, and in several states throughout the U.S. Season: Although these bracket fungi persisting throughout the year, they are annuals and release spores in late summer and autumn. 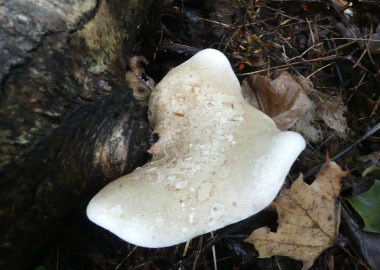 Gills: This is a polypore so there are no gills. They have small white tubes that are packed together at a density of 3 or 4 per mm; they measure between 1.5 and 5mm deep and terminate in white pores that brown as they age. 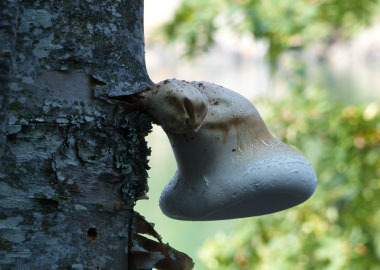 Edibility: Birch polypores are not known as being a culinary fungi however it can be used in a variety of ways. Young polypores can be sliced thin, marinated then roasted. Cut up and dried, they can be used as a tea although it isn't that great tasting. Dehydrating is a great way to preserve them long term (although exactly how long is not known). Once dehydrated they can be powdered, then add to any dish you prepare. Store in a cool, dark location once dehydrated.